High drama in Orlando as the Pride and Sky Blue FC played to a wild 2-2 draw at Orlando City Stadium on Sunday night. This game had everything: red card, handball, penalty kick — and so much more. With the score tied 2-2 as Orlando took corner kick in the 96th minute, Pride midfielder Emily van Egmond headed the ball on frame, outside of the reach of Sky Blue FC goalkeeper Kailen Sheridan. 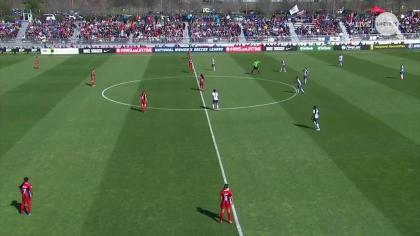 Sky Blue’s Carli Lloyd rose up and made contact with the ball with her arm, stopping the ball from going over the line. Lloyd was shown a red card by referee Luis Guardia for the handball. Pride forward Marta stepped up to take the penalty kick, hitting it low and with her left foot to the right side of goal. Sheridan dove the right way and easily collected the shot. Orlando got another corner kick after that, but still could not find the game-winning goal. Both sides had a few chances in the first half, but the score was 0-0 to start the second half — and that’s when the real fun began. Marta got the Pride a 1-0 lead in the 51st minute, following up on the play after a strong effort and shot from Dani Weatherholt hit the far post. The ball bounced directly into the path of Marta, who knocked it in for her fourth goal of the season. Sky Blue immediately answered, scoring in the 53rd minute. Shea Groom served a cross to Imani Dorsey, open in the box and Dorsey hit it with her right foot past Pride goalkeeper Ashlyn Harris. Dorsey appeared to have been kept onside on the play by Pride defender Alanna Kennedy. In the 59th minute, Groom gave Sky Blue their first lead of the entire season, scoring with her head after a cross from Savannah McCaskill. A cross from Lloyd — who subbed in in the 56th minute — set up McCaskill to start the goal-scoring play. Groom hit her head on the play and had to leave the match. Lloyd nearly scored for Sky Blue in the 69th minute after some nice moves in the box, but Harris tipped the ball over the bar. While Sky Blue was able to sub in Lloyd and Katie Johnson (83rd minute) in the match, Orlando answered with a double sub of their own in the 61st minute, bringing in Alex Morgan and Camila. In the 73rd minute, Camila played Weatherholt into the box with a pass, and Weatherholt stuck with the play and scored the game-tying goal. Morgan nearly had the game-winner in the 79th minute, but Sheridan tipped the left-footed effort over the crossbar. The draw drops the Pride to 8-6-6 with 30 points, still good enough for third place in the NWSL standings following the rest of the Week 19 results. But the Pride have just four games left to play, at least a game or two less than their nearest competitors. Sky Blue FC remains in search of their first win of the season. They are now 0-13-4 with four points. Due to the red card, they’ll be without Lloyd for their next match, on Saturday at home vs. the Houston Dash. 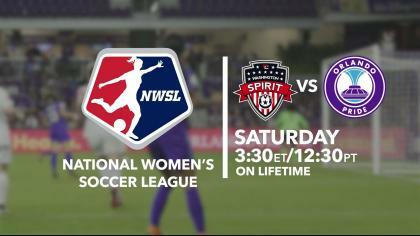 The Pride will next be in action on Saturday at home vs. Portland Thorns FC. Match ends, Orlando Pride 2, Sky Blue 2. Second Half ends, Orlando Pride 2, Sky Blue 2. Attempt missed. Chioma Ubogagu (Orlando Pride) left footed shot from outside the box is just a bit too high. Assisted by Alanna Kennedy following a corner. Penalty saved! Marta (Orlando Pride) fails to capitalise on this great opportunity, left footed shot saved in the bottom right corner. Carli Lloyd (Sky Blue) is shown the red card. Penalty conceded by Carli Lloyd (Sky Blue) with a hand ball in the penalty area. Attempt blocked. Emily van Egmond (Orlando Pride) header from very close range is blocked. Assisted by Alex Morgan with a headed pass. Attempt missed. Carli Lloyd (Sky Blue) right footed shot from outside the box misses to the left from a direct free kick. Offside, Sky Blue. Jennifer Hoy tries a through ball, but Katie Johnson is caught offside. Attempt missed. Camila (Orlando Pride) right footed shot from outside the box is close, but misses the top right corner. Assisted by Chioma Ubogagu. Attempt blocked. Marta (Orlando Pride) left footed shot from outside the box is blocked. Assisted by Kristen Edmonds. Substitution, Orlando Pride. Danica Evans replaces Toni Pressley. Attempt blocked. Dani Weatherholt (Orlando Pride) right footed shot from the centre of the box is blocked. Corner, Orlando Pride. Conceded by McKenzie Meehan. Attempt saved. Alex Morgan (Orlando Pride) left footed shot from the left side of the six yard box is saved in the bottom left corner. Attempt missed. 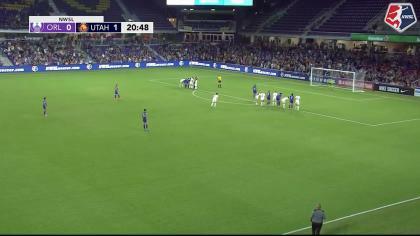 Carli Lloyd (Sky Blue) header from the centre of the box is close, but misses to the right. Assisted by Christina Gibbons with a cross. Attempt saved. Alex Morgan (Orlando Pride) left footed shot from the centre of the box is saved in the top left corner. Delay in match Camila (Orlando Pride) because of an injury. Attempt saved. Savannah McCaskill (Sky Blue) right footed shot from outside the box is saved in the top right corner. Goal! Orlando Pride 2, Sky Blue 2. Dani Weatherholt (Orlando Pride) header from very close range to the centre of the goal. Attempt missed. Alanna Kennedy (Orlando Pride) header from the right side of the six yard box misses to the right. Assisted by Camila with a cross following a corner. Corner, Orlando Pride. Conceded by Carli Lloyd. Attempt saved. Raquel Rodríguez (Sky Blue) header from the centre of the box is saved in the bottom left corner. Assisted by Sarah Killion with a cross. Corner, Sky Blue. Conceded by Ashlyn Harris. Attempt saved. Carli Lloyd (Sky Blue) right footed shot from the centre of the box is saved in the top centre of the goal. Assisted by McKenzie Meehan with a headed pass. McKenzie Meehan (Sky Blue) wins a free kick on the right wing. Attempt missed. Alanna Kennedy (Orlando Pride) header from the centre of the box is high and wide to the left. Assisted by Marta with a cross following a set piece situation. Attempt saved. Alanna Kennedy (Orlando Pride) header from the centre of the box is saved in the top left corner. Assisted by Marta. Corner, Orlando Pride. Conceded by Erica Skroski. Substitution, Orlando Pride. Camila replaces Christine Nairn. Goal! Orlando Pride 1, Sky Blue 2. Shea Groom (Sky Blue) header from the centre of the box to the bottom left corner. Assisted by Savannah McCaskill with a headed pass. Substitution, Sky Blue. Carli Lloyd replaces Madison Tiernan. Attempt missed. Dani Weatherholt (Orlando Pride) right footed shot from outside the box is high and wide to the right. Assisted by Marta. Goal! Orlando Pride 1, Sky Blue 1. Imani Dorsey (Sky Blue) right footed shot from the centre of the box to the high centre of the goal. Assisted by Shea Groom. Marta (Orlando Pride) hits the bar with a header from the right side of the six yard box. Assisted by Chioma Ubogagu with a cross. Goal! Orlando Pride 1, Sky Blue 0. Marta (Orlando Pride) left footed shot from very close range to the centre of the goal. Attempt saved. Dani Weatherholt (Orlando Pride) right footed shot from the left side of the box is saved in the top right corner. Assisted by Chioma Ubogagu. Delay in match Chioma Ubogagu (Orlando Pride) because of an injury. Second Half begins Orlando Pride 0, Sky Blue 0. First Half ends, Orlando Pride 0, Sky Blue 0. Attempt blocked. Marta (Orlando Pride) right footed shot from the centre of the box is blocked. Assisted by Chioma Ubogagu. Attempt missed. Emily van Egmond (Orlando Pride) right footed shot from outside the box is high and wide to the right. Assisted by Marta. Attempt saved. Dani Weatherholt (Orlando Pride) left footed shot from the centre of the box is saved in the centre of the goal. Offside, Orlando Pride. Marta tries a through ball, but Rachel Hill is caught offside. Kristen Edmonds (Orlando Pride) is shown the yellow card for a bad foul. Imani Dorsey (Sky Blue) wins a free kick in the attacking half. Offside, Orlando Pride. Toni Pressley tries a through ball, but Rachel Hill is caught offside. Attempt saved. Imani Dorsey (Sky Blue) right footed shot from the centre of the box is saved in the centre of the goal. Assisted by Savannah McCaskill with a through ball. Attempt missed. Dani Weatherholt (Orlando Pride) header from the centre of the box misses to the right. Assisted by Marta with a cross following a corner. Hand ball by Savannah McCaskill (Sky Blue). Offside, Orlando Pride. Marta tries a through ball, but Emily van Egmond is caught offside.